The App Mining program is incredibly flawed. In short, I have concluded that the benefits of participating in the program are simply not there. I say this with great sadness, considering developing dApps on the Blockstack platform had gladly consumed all of my free time for the past four months and provided me with an unreal reignition for dApp development. I am an early adopter and not new to blockchain technology or dApp development. While developing dApps using Ethereum, I was turned off by the immaturity, unprofessionalism, and lack of innovation that still persists in the cryptocurrency and blockchain scene. You can imagine how excited I was to see the release of Blockstack’s App Mining program. The claim was that Blockstack would pay (BITCOIN !!!) to the best apps every month (and no Solidity, required, wow). The better your app, the more you earn. Simply too good to be true. As a full time developer with bills to pay, this didn’t seem like it was worth the risk, so I signed it off as just another crypto missed opportunity. In December, a friend of mine mentioned the program and inquired why I wasn’t participating. I stated that there was no way I’d be accepted and I had no time for such risk. I’m just a lowly developer and there must be extreme barriers to entry and tons of contracts to sign, I thought. It was $20,000/month after all! He reassured me it wasn’t much of a hassle and I should at least give it another look. After a little bit of consideration and browsing, we decided to build a product together. My holiday break was spent only building our app. Easily implementable, soverign identity and data storage; I became obsessed with all things Blockstack, encryption, and the downfall of Google & Facebook. All-nighters, relentless sprints, nonstop code. I evangelized to everyone around me about Blockstack. My family thought I had discovered Bitcoin again. It was awfully unhealthy, in hindsight. I tweeted about Blockstack Gaia in hopes some other developers would have an AHA moment as well; I rarely ever tweet. We ultimately did not launch on Product Hunt, as I did not feel the product was up to the right standard (lmao, big regret. would have scored higher than the fully functional, working product with 10x the users), and not quite launchable yet. We reprioritized our focuses, but our desire to build this decentralized platform and get it right, powered by Blockstack, was top of our mind and always the center of our conversation. My lingering excitement drove me to keep building and since then I have developed a high use (relative) app on the platform, spawned a Blockstack node, created two Blockstack developer utilities that I’ve been preparing for open-source, have two new fully decentralized projects ready to ship, and install blockstack.js into every project I start. Over the past few days, I have found out these efforts were fruitless. I understand decentralized governance takes time. I understand building good software takes time. I understand we are all human. I understand no one is entitled to anything. I understand a lot of these criticisms have been mentioned before; since the launch of the program in fact; I have participated in some of these discussions. The exact same problems are still around. These are critical bugs, that are still being voiced by some of the same developers. Ultimately, I have helped Blockstack achieve their OKRs by publishing apps and evangelizing, but don’t feel as if the developer’s concerns are being heard. Democracy Earth : I personally believe that the Democracy Earth portion of the vote is at this point a reason alone, to not join the program. While I commend the DE team’s mission and their work on the platform, I believe the platform is more detrimental than not to App Mining. Participants will be faced with the challenge of acquiring DE upvotes, which mathematically, fundamentally, and according to Blockstack, is the most scarce resource. More scarce and less equally attainable than the other two voting metrics. Combined with the fact that votes persist each round, this metric is no longer an equal part of the average of the scores. Ultimately DE becomes a pyramid scheme/situation in terms of the algorithm. Once someone gets on top, they’re set. 2 DE votes is just about the same as 100, considering the 1%ers have so many. Z-indices and stuff. This issue is exacerbated by the fact that Stacks token holder voters either aren’t increasing enough to increase the supply of votes, or they simply aren’t participating in the program by reallocating/using their votes, or both. I also have to mention that Democracy Earth, at least in the way it’s used here, isn’t very democratic… Vote intensity (allocating 700 vs 1) destroys the power of “a” vote. Is a product that receives 700 votes 700 times more fitting for Blockstack than one that recieves 1? A vote of nay, yay, or abstain, in this case, would be more equitable. If that proposal is considered less democratic than the current process, then maybe the program don’t need a democracy-oriented reviewer (lol). The documentation explained that communciation happens within the DE platform and this is the way in which voters determine who to vote for. While this is the intended process, this is not happening in practice. Applications with no debate/comments have votes while others with with comments and/or replies may have very few or no votes. The conclusion one can gather is that voters may already have an idea of the product(s) they would like to vote for prior to or outside of accessing Democracy Earth. Given the scenario a product achieves a perfect score in all other metrics and a low or zero DE score, their product would be considered a disaster if they don’t receive an earth-shattering amount of Democracy Earth votes. This is a major bug. Your result is at the mercy or not of voters who may or may not show; not the strength of your software. Product Hunt : Several aspects make this reviewer a bad choice for the program. The most glaring issue is the fact that votes aren’t indicative of actual engagement as votes can be purchased and accounts can be created at vote time with the purpose of boosting vote count. Additionally, I don’t have very much confidence in the Product Hunt team scores. I understand there is a criteria they base their decision on, but what are the attached findings and reasonings. Say perhaps, someone knows someone on the PH team. A friendly gesture could easily masquerade as a 8.75 PH team score. I’d also like to add that it’s general understanding that crypto-related projects don’t perform as strongly organically on PH compared to non-crypto related projects, so I think this skews the the opinions of if a product is “good” or not. TryMyUi : This is not good at all. Yes, critique and feedback from general users is good. I strongly believe in this. However, it is not the time. We, crypto engineers, know we are in the early days of dApps and crypto technology. Intellectuals aren’t even comfortable sending crypto transactions or setting up their own BTC/Lightning nodes. Receiving UI/UX feedback on dApps from general computer users is just noise, especially when even we are just experimenting. It would be extremely useful if these users had a pre-vetted desire and/or understanding of using new tecnologies. The feedback they provide can be arbitrary/opinion-based (scale of 1-5), consist of extreme outliers, temporary technical disturbances, unlucky bugs, and some useless feedback. One user rated our product all 1’s, part of the reason being it was not advanced enough for someone like him, and when asked to provide any more information, gave none. As a product developer, I’m not too sure what to do with that. From my point of view, I feel disconnected from the community. I feel as if there is always competition against the incumbent products/developers who are building on Blockstack when I’m looking for feedback or posting an update. The app my partner and I have delievered isn’t a game-changer at all, but people are using it and seem to like it. Users are emailing us with feedback, feature requests, and would love to see our continued development. According to multiplayer storage data, our app is one of the most installed. It has been installed by more users than many of the most “popular” apps on the platform. However, I don’t see it when visiting popular Blockstack apps on app.co. All apps on the platform should be promoted in my opinion. By all means, promote Graphite Publishing, but don’t pretend it’s better than Airtext, Sigle, Humans, etc… Graphite Publishing will consistently receive a better ranking compared to better quality apps in the same category (just from the DE score alone). While other apps have more users and are pushing more updates and fixes, this means nothing if you aren’t recognizable. Not to mention, I am afraid to release a 100% decentralized framework for Blockstack dApp building because radiks-server exists (nothing against you Hank; mad props). I feel like I would be looked down upon or no one would attempt to give it a shot. I also have never heard from Muneeb or Ryan and feel as if they may not even know about some of the apps that exist on their platform; but this is not fact, just a feeling. Are they happy a developer is excessively and unhealthily enthused about their platform? Are they seeking happy developers and developer adoption, or just apps on their platform at whatever cost necessary? I also see no Blockstack factilitation or triggering of communication between Stacks holders, developers, designers, etc. It’s kinda just loose, and doesn’t feel like a community at all, especially given the competition. I feel stranded. I’m evangelizing everywhere I can, digitally, and in real life, but in the Blockstack community, I feel like I can’t exist. Who are you? What gives you the right? I am a nobody, just a random developer who really loves de-tech and hopes to see some cool crypto projects survive and flourish and be around 5 years from now. I am not a tech influencer and don’t have anything to gain from posting this, but just hope Blockstack can learn and improve the process and hopefully any newcomer will see what they are truly up against before making the plunge. The program is becoming very infeasible for newcomers. The work that is put in at this point simply isn’t worth it (if you’re striving to do the absolute best job you can). The early movers have locked in guaranteed funds and don’t have to even update the site anymore if they choose not too, whilst a lower ranked app has to significantly improve to increase their position, let alone scrape through to the top. The longer they stay there, the worst it gets. Cause averages. This is just month 4. These apps are set. I wrote this because I am very very discouraged by this process (and withdrawing my personal negative experience, I am not the only one). What began as a hopeful year and major shift in engineering mentality, has turned into one of my most costly failures. I am experiencing the same cycle I had with Ethereum. I can’t participate in a program that rewards cheating/copying over merit/effort. This is not conjecture. We know people gamed votes, and now their scores will forever reflect that. We know people just placed Blockstack authentication on their app and their scores will forever reflect that. We know that these participants are still enrolled in the program and will continue to make money from their efforts; they were not disqualified. Imagine a newcomer that finds that out after the fact… Will there be any disclosure, at the least, or will they all continue to receive retweets, blog posts, and praise. Decentalized tech companies tell us not to trust Big Tech, but I have yet again found my trust misplaced, this time, by Blockstack PBC! I have given the benefit of the doubt and hope that there will be some transparency in this. I’m not Bill Gates, Alexis Ohanian, or Justin Hunter. I don’t have a PHD and I dropped out of college, but between myself and my partner we have founded and currently run software for hundreds of thousands of users. I think we have a good bit of grit and founder’s mentality. We never stop building and trying to improve. (Coincidentally, my partner has organically grown an ecosystem of hundreds of developers building software on his platform. He knows a thing or two about growing a developer community.) This became a business experiment for us. How can we possibly shift all of our software to Blockstack? We want to protect their privacy; we want to increase crypto adoption; we wanted to go full Blockstack. Not just auth; the whole 9 yards on one our highest-traffic projects. We have concluded we don’t have the support of the Blockstack community and most importantly, the economic and technical burden would come at a massive loss. It’s cheaper (incredibly expensive) to foot the bill and pay Big Tech to sell our user’s data, than to pay the technical cost of migration and possibly keep half or our users. Building a landing page for a product we never intend to build, might just net us a better payout. I’ll close with this. The founders and developers you’re looking for aren’t coming for a long time if this is the state of affairs. This space is already shunned externally due to crypto hysteria, immaturity, and ICOs. Sure, you’ll make some money, early App Miners will make some money, and some token holders will make a return. 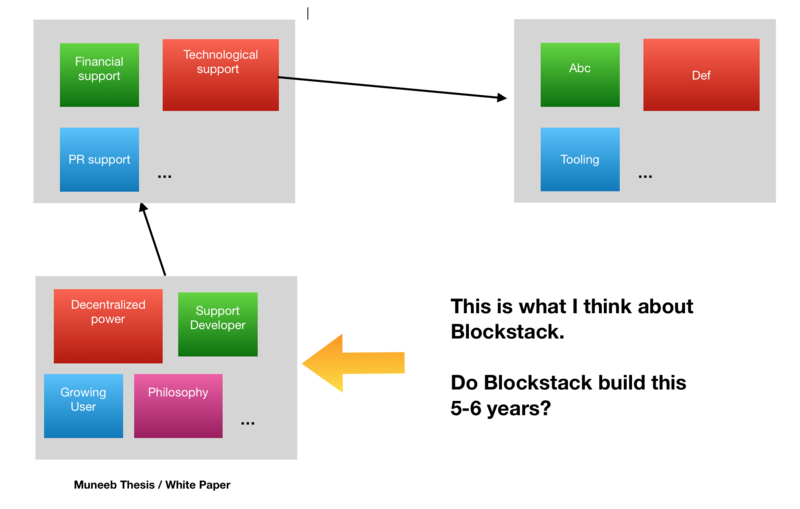 But where is Blockstack, five years from now? 1000 developers? 10000? 100000? Or does it die a pyramid like most everything else in crypto? At what point does integrity, equity, true decentralization, etc, become the true goal instead of words on a pitch deck. The founders and developers we want in this space are going to keep working for Big Centralized Tech. A handful of those who do love crypto development beyond the money, will continue to get discouraged and leave, or get laid off. You need developers to run nodes and develop on your platform, to keep this running. Don’t alienate us. I wil go cry myself to sleep now. Good luck to all the developers! Not to mention, I am afraid to release a 100% decentralized framework for Blockstack dApp building because radiks-server exists (nothing against you Hank; mad props). I feel like I would be looked down upon or no one would attempt to give it a shot. A lot to discuss here, but just wanted to address this. PLEASE feel free to hack on your own framework - I bet you have some great ideas that would advance the ecosystem. Radiks is not an end-all-be-all type of thing, it’s useful for specific contexts. You will not be looked down upon - quite the opposite. I can assure you that everyone on the team, and likely most app developers, would be really stoked to see you put something out. One issue with Blockstack is a lack of third-party developer tooling and contributions - we definitely talk about it internally. We REALLY would like to change that, and so if you wanted to build a new framework, you would definitely have people wanting to try it out, including myself! I hear you. The main change we’re working on getting implemented is quadratic voting, and applying that retroactively. This would reduce a lot of the issues you mentioned, and would do a lot to spread votes around. It might not be the perfect solution, but I do believe it would help. We haven’t discussed this yet, but for the first time, Product Hunt has provided us with a ‘credible upvotes’ number, based on their internal algorithms to detect suspicious voting. This has had a surprisingly large effect. Additionally, I don’t have very much confidence in the Product Hunt team scores. Same, which is why we dropped them this time around. TryMyUi : This is not good at all. I personally tend to disagree. Yes, we’re wading in new waters here, and people don’t “get” it. But we’ve decided that we want to get to a place where “normal” users are comfortable using decentralized apps. This means focusing on UI/UX. Getting video feedback from “real” users can do a lot to highlight where you can improve. I’d also note that the biggest outlier scores are dropped before ranking you in app mining. This partially solves the issue of outliers with arbitrary scores. A singular computationally objective metric like installs (I understand this wouldn’t work for singleplayer) would be a stronger show of product-market fit. The single player issue is worth addressing. Also ID creation is super easy to game, it would likely be our most game-able reviewer. But maybe there are some methods or technology we could employ to fix this. Would love to hear your ideas for overcoming those challenges. There is a real opportunity for improvement here … TryMyUI has been great for me, but my app is focused on general users … categories of apps should be able to target categories of users … so that a user profile that reviews “Utilities & Productivity” isn’t the same as a profile that would review “Wallets” & “Financial Services”. IMHO. @brycedev thanks for your open communication. I may not agree with every point you make, but the veracity of the perspective you provide will help improve this community. That said, there’s definitely been some challenges for mobile vs. desktop that I’ve documented in past. I haven’t had time to review Stealthy’s TMUI March result reviews yet, but interestingly they literally took a 1 point drop in theta from 0.49 to -0.56. Not sure what happened there, but if it’s not a system failure, that’s a lot of variance in judging and result quality to stabilize algorithmically in App Mining. Completely agree with @hank on this. As I scale my apps out, I’d love to see alternatives. Plus, we’re still early in this game … there is so much to figure out. Nobody has all of the right answers for all use cases. I strongly disagree with this. Blockstack has been around since 2013-2014 (5-6 years). Yes, De-tech is in early state but you can’t say a project 5-6 years is in early state though. How can we tell people that they shouldn’t use GAFA because it’s centralized but Blockstack is centralized too??! And when it become decentralized system (if PBC intent to go there) <<<>>> Satoshi leave Bitcoin for good! You didn’t understand my post at all. I was referring to developer tooling, in reply to Hanks comment on developer tooling. DE: While quadratic voting will alleviate a big issue, the most pressing problem is dapp discovery. I think voters are having a hard time finding dapps and it gets harder with more dapps (now 50+). So not enough voters unable to find dapps they are interested in leads to issues. I think I fully understand your post. But you didn’t understand my post. What is the problem you are seeing? Please describe.